Indochino Inc. is one of Canada’s fastest-growing ecommerce businesses. So why the heck is it opening up bricks-and-mortar stores? It’s a fair question given that some retailers like Grand & Toy have shuttered their physical locations to go online-only. Yet Vancouver-based Indochino is doing just the opposite. Indochino launched in 2007 as an ecommerce site where men can order and buy made-to-measure suits. This year it expects to sell between 120,000 and 140,000 suits worldwide with an ambitious goal to sell 1 million suits per year by 2020. The company said its business doubled in the month of December alone. With growth like that, the e-tailer (or is it e-tailor?) has obviously found the right fit with online customers. So Indochino’s decision to enter the bricks-and-mortar game signals a major shift in its strategy. After experimenting with pop-up shops, the company opened its first permanent physical store (Indochino calls them “showrooms”) in 2014. Now it has a total of seven stores in Vancouver, Toronto, Boston, New York, San Francisco, Philadelphia, and Beverly Hills. 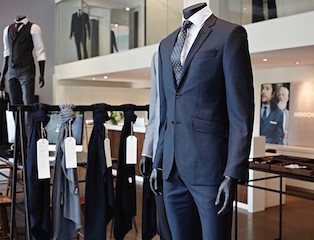 One of the seven bricks-and-mortar showrooms Indochino has opened since 2014. It’s a new frontier for Indochino, which also has a brand new CEO. Although Drew Green only took over the top job last month, he’s a veteran of ecommerce on both sides of the border. He spent five years as head of sales at online ad firm DoubleClick (acquired by Google for $3.1 billion in 2007), then oversaw sales and business development at U.S.-based Shop.com before co-founding Shop.ca in 2009. When Green took the stage for a presentation at Toronto’s MaRS complex on Thursday night, he not only talked about why his company is adding physical stores to its virtual model but also offered up tips for retailers of all stripes here in Canada. “For the longest time, especially in the media but in boardrooms too, there was this terror created about the future of bricks-and-mortar,” Green said. Green said he views bricks-and-mortar as just another channel – like online or mobile – within Indochino’s multichannel approach to sales and customer service. In fact, Indochino plans to expand to 150 showrooms by 2020. Don’t fall into the trap of running your physical store the same way you manage your ecommerce operations, he warned. “It’s important to realize that it’s different and embrace that,” Green said. It’s crucial to understand that a physical store “needs to be more than a hub of products but a distinctive experience,” he added. Indochino offers a completely different experience in its showrooms than it does online. While the website offers the convenience of ordering customized clothing without taking the time to visit a store or a tailor, staff in the showrooms sometimes spend up to two hours with one customer. 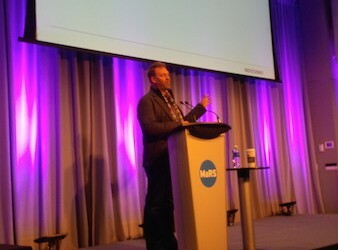 Indochino CEO Drew Green at MaRS Toronto. In a retail environment where Amazon promises same-day delivery even on Christmas Eve, consumers are more impatient than ever. Green believes inventory management is the key to competing in this kind of retail landscape. Traditional inventory models try to stockpile enough product on hand at each store to fulfill customer demand. In the virtual model used by Amazon, retailers strategically set up various distributors or suppliers (who are sometimes third parties) near their largest customer bases, then fill each order via whichever one is closest to the customer’s location. Don’t be afraid to reach out and strike a deal or alliance with another company if it adds “complementary resources and capabilities” that can help you grow faster and operate more efficiently, Green suggested. He called it the move that’s most often overlooked when companies are trying to grow and succeed. “We’ve seen some companies entirely fail because they don’t embrace partnerships … because they don’t feel they need to partner with anybody else. We feel the opposite,” he said. Use data to anticipate what customers need before they know they need it, Green advised.